Think fast! If you're looking for meaning, these clocks have some for you. Gunky keyboards can malfunction; for a deep clean, some boards have keys that can be removed and put back. Everyone from age 1 to age 99 should establish routines for when to eat. No, dear. You know you only get that privilege when your age is an odd number that divides the factorial of its digit sum. No, dear. You know you only get that privilege when your age is abundant. No, dear. You know you only get that privilege when your age is a Mersenne prime. No, dear. You know you only get that privilege when your age written in binary is prime when interpreted as octal. No, dear. You know you only get that privilege when your age is a two-digit number that is divisible by the product of its two digits. No, dear. You know you only get that privilege when your age has an odd square factor greater than one, but no odd fourth-power factors greater than one. No, dear. You know you only get that privilege when your age is the largest number in a primitive Pythagorean triple. No, dear. You know you only get that privilege when your age is a palindrome in binary. The racket would melt before it got hot enough to make hash browns. Just use a griddle. No relation to the comic this time, other than the title. If I was going to make these puzzles harder, I'd add a little something to each of them, mix them up, and I'd definitely try to get answers that were more thematic. As it is, how hard would you rank this puzzle set, in a single word of an appropriate length? This solution was a collaborative effort between several people. If you like the answer, please also upvote those answers (linked below). I have pulled everything together here so that there is one comprehensive answer. numbers that have exactly 2 prime factors. The "Think fast!" written on the 7th and 9th clocks indicate that we should consider those clocks in 24-hour time (as per the linked comic). Easy enough, the letter I is removed. Weird. Only gibberish. But the previous sentence was talking about keyboard changing. What if we changed this from Dvorak? Neato. Looks like the N key broke too. E key down. Next message. The particular diacritic letters seems to suggest Turkish, and indeed this is the Turkish F-layout. The T key was removed. And now, the L key. This one is the Neo layout. At this point I realize that the numbers are actually hints for the layouts. (Yes, I identified/trial and errored all of the previous layouts.) Notably, if we take pairs of digits and interpret as A=1 Z=26 code, they give QW for QWERTY, DV for Dvorak, CO for Colemak, WO for Workman, F-K for F-Keyboard, NE for Neo. The next one is therefore BL for Blick. 0212 anos ovr. oka, hs kboard has go hawr;  an hrowg  awa ow. 0212 ? over. okay, this keyboard has gone ? ; i ? throwing it away now. Now taking the keys removed at each run, we get the word INEPTLY for the answer to this part. I did the math for Part 3. If we take the count of the numbers that satisfy each property, we get 14-21-3-12-5-15-14-19, which in A1Z26 comes out as NUCLEONS. 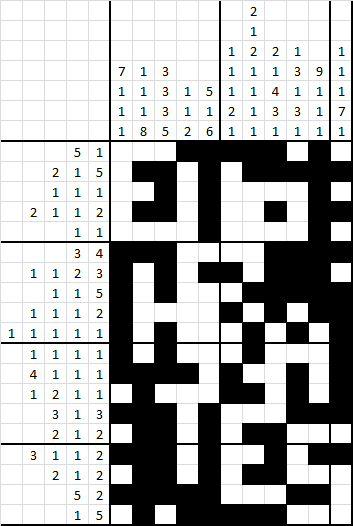 Here's the solved nonogram from Part 4. I'd add a little something to each of them, mix them up, and I'd definitely try to get answers that were more thematic. MOHS, which refers to the Mohs scale of mineral hardness. how hard would you rank this puzzle set, in a single word of an appropriate length? The letter-added solutions to the four parts have an average length of 9.25. The closest number on the Mohs scale to that is 9, which refers to CORUNDUM. Which this puzzle certainly is! the times are all numbers that have exactly 2 prime factors. 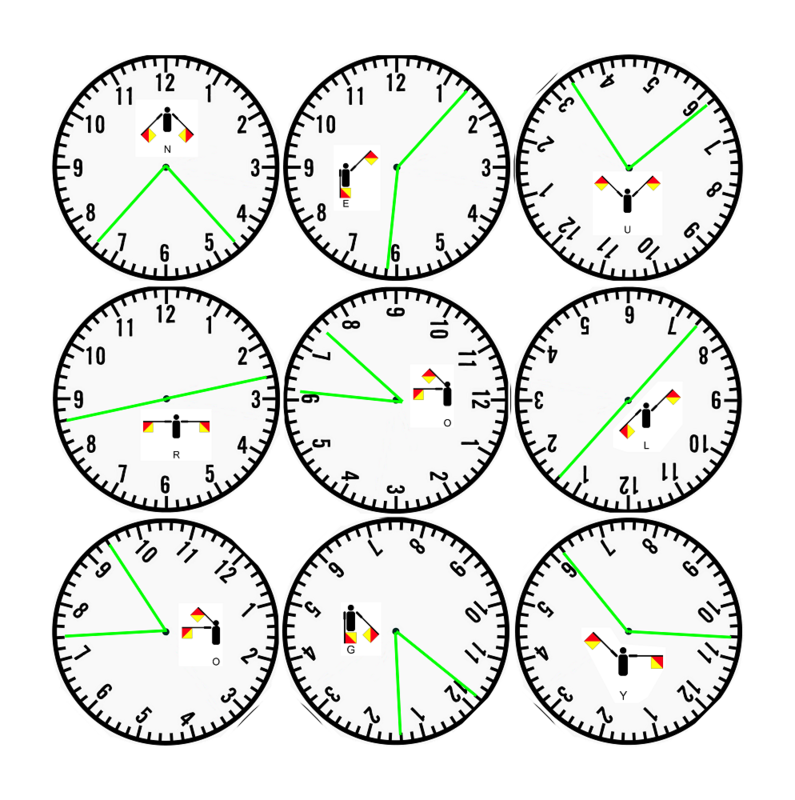 all factors are smaller than 60, so they correspond to directions in a clock. Connecting the specified directions of the factors to the center (in the same orientation as the clock is originally) gives us flag semaphore for NEUROLOGY. Caution: This post contains lots of spoilers, right from the start. I drafted a lot of ideas for various titles in this FTC, but I really wanted to make a small metapuzzle if I could. When I saw "Making Things Difficult" as a title on the list, I latched on to that one as my metapuzzle title, and with transadditions (anagrams plus a letter) as a mechanic that provided flexibility and a possible hook back to the title. After changing the meta mechanic, I generated new answer lists. The individual puzzles came about from looking for satisfying pairs between my generated answer lists and the FTC titles. Keyboards are Disgusting was the last puzzle to be made. 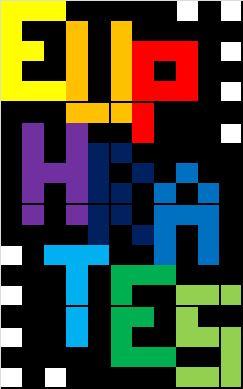 The other puzzles were all mathematics-based in some way, and I wanted to include a word/cipher puzzle somehow. The keyboard cipher puzzle was on the draft list, and I found an answer I was happy with on the list. Snacktime Rules is directly inspired the comic and the belief that the puzzle set wouldn't be complete without a strictly mathematical puzzle. 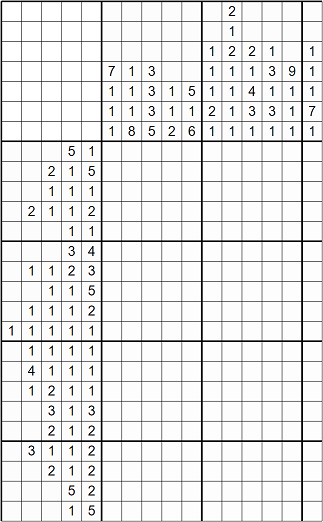 I really like making grid deduction puzzles, and a nonogram puzzle gave a lot of flexibility for an answer. Originally, the griddle pun was just meant to play on grid and grill/grille from the comic; when I found out that one of the many alternate names for the nonogram puzzle type is 'Griddler', it was just icing on the cake. Creativity and logistics ended up somewhat intertwined, by the nature of the meta mechanic restrictions. Note that there are even more explicit spoilers in this section. 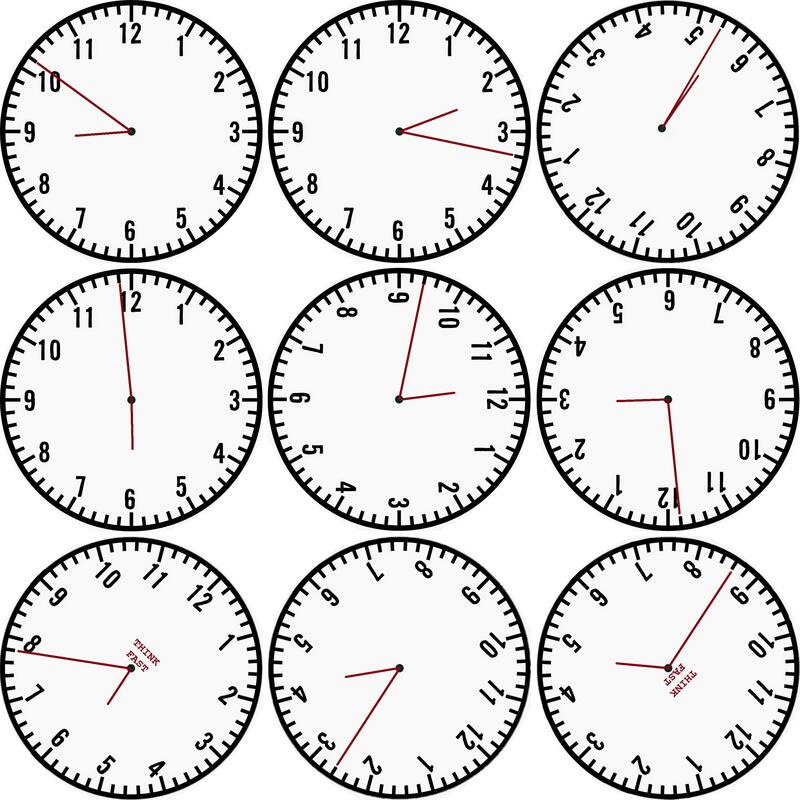 Logistically, I would have preferred if I didn't have to rotate any of the clocks, but unfortunately the prime positions that would spell U and O don't multiply to valid times. (e.g. 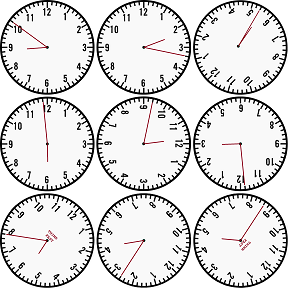 22:79) Since some of them had to be rotated, I decided to rotate a lot of them, so that it didn't seem weird/inconsistent that just a few were rotated. To distinguish between the 12-hour time and the 24-hour time, I was originally planning to use just a simple P.M. indicator, but I decided to go with the "Think fast" line from the comic instead, which was specifically used after the clock was switched from 12- to 24-hour. xkcd has been making jokes about Dvorak for years (personal fave) There's lots of other keyboard layouts, but I tried to stick to non-QWERTY-based Latin-script keyboard layouts from the linked Wikipedia list. By losing a letter each time, it meant that this cipher wasn't just something to dump in a cryptogram solver. I was also happy to realize how much the layout changes were going to mess with the punctuation, turning commas into letters and letters into semicolons, even as the spaces were conserved normally. The actual message wasn't written with a particular story goal in mind, but I wanted to make sure each line had the new missing letter removed from either an obvious word or from a word that is clued from the context of the previous line; each new layout starts with two words ending the sentence from the previous line. With that kept in mind, it was mostly free flow. In an early draft, I thought about doing this with just QWERTY, Dvorak, and Colemak, and having the story involve the narrator relearning the layout as it changes each time; in this way, the cipher would be changing each time, starting with QWERTY->Dvorak, and then Dvorak->Colemak, etc. I decided that was probably more confusing than interesting, and changed the text to always use QWERTY as the basis with a greater variety of other layouts. The numbers were a late addition; originally, I was just going to let the changes be sudden and leave the solver to figure them out. But I was worried that not having easily defined start points and end points would be discouraging for the later sentences, which still look like nonsense once properly deciphered. So I added in the A1Z26 codes for the first two letters of the name of the keyboard layout, hoping that with QWERTY and Dvorak (and possibly Colemak) as well-known, the others would be meaningfully distinguished. As it turned out, phenomist solved this section almost completely before realizing what the A1Z26 codes meant, so the first draft wouldn't have been too bad. Still think it was a good idea to add them, though. 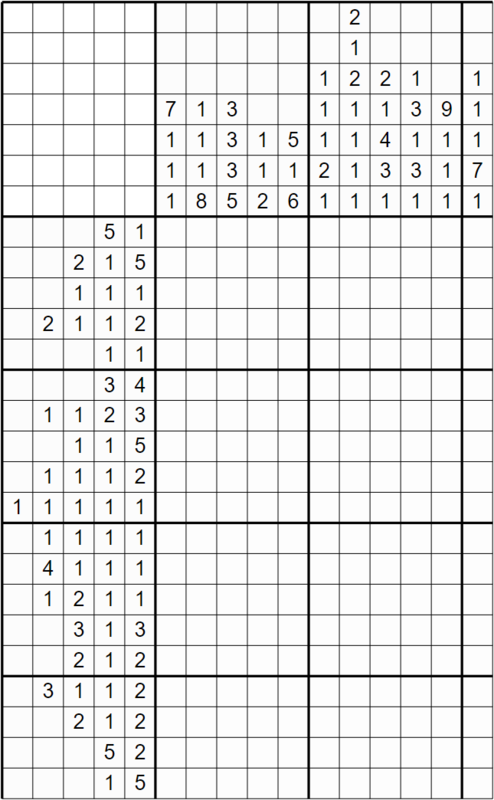 I only briefly considered trying to clue the answer pictorially in the nonogram, but that would have made the grid very large, and I'm not sure how many people would recognize the land between two rivers from a pixellated attempt to draw the rivers. So I decided on 3x5 letter shapes. At first, the letters were in the black cells and the letters were aligned, but that made the nonogram too easy, since so many of the rows/columns had a unique solution. Then I tried staggering them in a couple ways, before choosing the version seen in the puzzle. At this point, I switched which cells were shaded and which cells weren't, to make the letter shapes less obvious while solving the grid. Finally, I added some symmetric salt-and-pepper in the unused corners, since once again, the puzzle was made far too easy by having the edge rows/columns as single blocks of cells. I was using http://a.teall.info/nonogram/ to quick-check solvability at each point, and then solving myself to check difficulty/strategies. Most of my resources are mentioned above. Wikipedia for keyboard layouts, OEIS for parts of Snacktime Rules, my own Python code for another part of Snacktime Rules, and http://a.teall.info/nonogram/ for quick-checking nonograms. I wrote my own Python code to check the UKACD wordlists for possible answers to feed the meta, and used https://nutrimatic.org/ to check those answers. This puzzle had a few typos when it first went up. In one case for Snacktime Rules, I forgot that $98<99$, and so I appended a condition to fix the answer counts. There's also some typographical errors in Keyboards are Disgusting, but luckily those didn't affect the solve majorly. Most of the time what was running through my mind is, "Gosh, I hope this is actually as fun to solve as I think it is." My great fear is that I'll make a puzzle that I think is interesting and fun, but everyone else finds mind-numbing and tedious. Luckily, the puzzles are all pretty small, and often have a way to write a program to help with parts that might otherwise be tedious. The meta ended up being overclued, but I don't think it suffered from that in the same way that it would have really suffered from being frustratingly underclued. If I did it again, I wouldn't change this meta, but I'm definitely planning a harder one for the future. This was my first meta posted to PSE, and I'm pretty happy with how this all went. 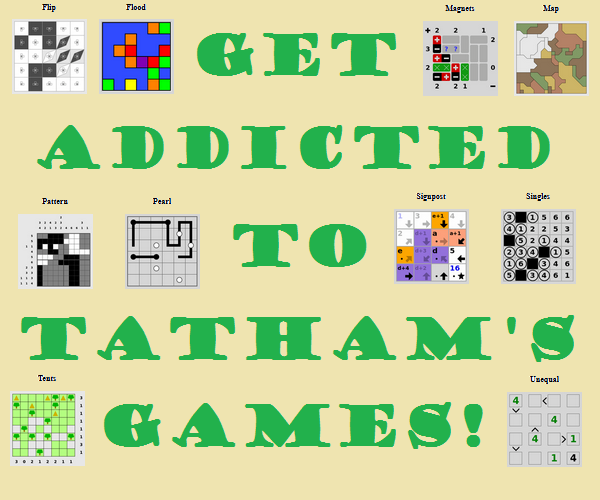 add a letter to each puzzle answer and anagram. which are definitely more thematic to the flavortexts of their corresponding puzzles. Added letters spell out MOHS, possibly referring to Mohs' scale? Not the answer you're looking for? Browse other questions tagged cipher enigmatic-puzzle calculation-puzzle grid-deduction metapuzzles or ask your own question.